UPDATE 03/30/2013 – The original post used older tools to try and make this work. I had issues with multipath and decided to call Dell as my MD3000i was still in warranty. While they would NOT support this or my OS, they did offer me the latest Resource CD and answered a few questions along the way. Thanks to their help, and various blogs on the interwebs, I can confidently setup CentOS 6.4 to a Dell MD3000i utilizing MPIO. I’ve also submitted this blog to my technician, along with my /etc/multipath.conf file to share with the Dell ESS team should any other Dell customers inquire on this setup, they would have a reference. I’ve successfully setup three different Dell servers using this procedure. Recently I worked on a project to stand up a CentOS based XEN environment using Dell hardware. I’ve used Linux in the past, mostly on test machines and for specific software vendor builds. My experience and day-to-day in my career has been in Windows Server administration, so I decided to extensively document my configuration and experience during the setup over a series of posts. The hardware involved (minus switching, Cisco) in this project is all Dell, specifically, Dell PE servers (M600’s) and a Dell MD3000i. The XEN servers will be utilizing the iSCSI space for 3.8TB of R10 storage.We are using some specialty software that requires the use of CentOS, so the base OS for these boxes will be CentOS 6.4. By choosing CentOS 6, this will allow us to use XEN v4. Dell supports RHEL6, so they inadvertently support CentOS 6 as well; however, the md3000i product is EOL, no further firmware updates have been released, and the resources will not officially support RHEL6. I documented my setup and configuration of the host components as I went and turned it into this guide so that anyone searching for help with this particular setup may be helped. Now let’s get started, below are the steps that we will perform to get a CentOS 6.x, specifically 6.4 host from build to XEN host with iSCSI backend storage. First we get the server on the network. Look for the adapters named “ifcfg-xxxx”, yours may be em1 or p3p1 depending on your situation. You can view the below file for a breakdown of how your system maps network adapters to MAC address and also manufacturer. For example, (igb) and (0x8086:——) equals Intel, (bnx2) and (0x1434:—–) equals Broadcom. In my case running the modprobe dev worked, followed by running the service start again. Whatever you decided, make sure you are able to identify the host and that it does NOT match another server. 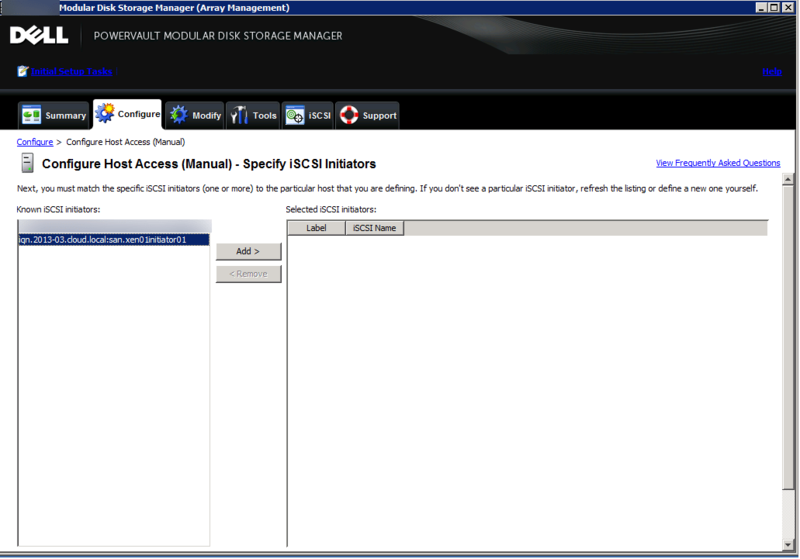 We’ll finish the configuration of the iSCSI adapter later. In order to configure the md3000i host components on your CentOS 6.x system, we need to install some components. We need to set the multipath.conf file, but this will be done later. Dell will add to this file if we created it now complicating things. This Resource CD contains the drivers and software for the MD3000/i, MD32xx/i, and MD35xx products. It also has the drivers for coexistence, should you want to connect to multiple MD series models concurrently on the same host. You will either need to burn the CD and insert it to your server, or easier yet, if you have iDRAC mount it or you can use an NFS share. We’ll need to create a directory and mount the CD, regardless of which method you chose. On one of my servers this was the case because I had a USB DVD drive attached. Try /dev/cdrom1 in this case. Now that we have the resource CD mounted, we’ll need to navigate to the root of the CD and run the installer. My entries are in RED, I have a Windows server that has the MDSM utility installed and manages several of these SANs. I only am interested in the host components for this project. Further this is the only scenario I’ve tested, and most likely if you are running a Linux server you don’t have a GUI. 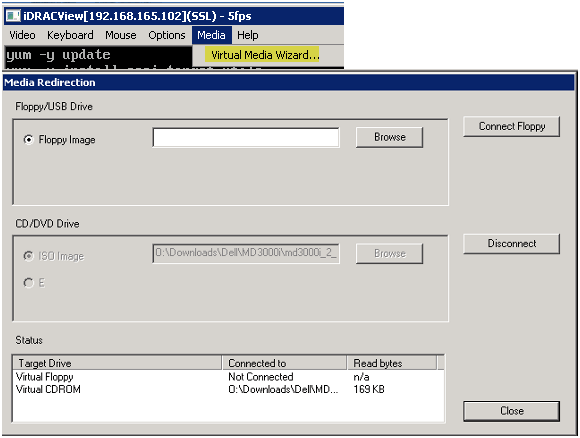 TLDR: Only install host components, use a Windows server to manage MDSM. Make sure that you select 5, for MD3000i when prompted during the installation. monitor all Dell PowerVault MD Series Storage Arrays available on your network. 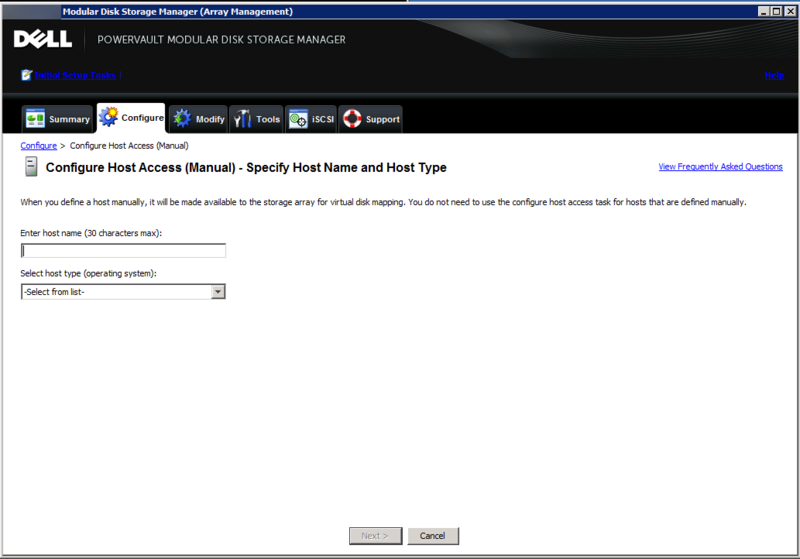 Choose the MD Series storage array that you are connecting to the host server. a non-fibre channel option, multiple selections are allowed. first time the system is rebooted? You must restart the system to complete the installation. I told the software not to reboot my server, but it did anyways in my case every time. Maybe it’s a bug or maybe it does not like me, either way be prepared for that to happen regardless of your choice. *NOTE – Dell will modify the /etc/multipath.conf file we created earlier. Go back into this file and remove anything modified by the installer and make it match the above /etc/multipath.conf file. Now we are going to setup the multipath configuration file. It is VERY important that the un-commented data be exactly like mine. Remove the existing file and create it anew is the easiest way to do this. *Note – We’ll be updating this file again later to add an alias for the WWID. More on that later. Now you need to go to the MDSM and configure the access for your initiator. I have MDSM loaded and managing multiple arrays on a Windows Server. I’ll show you how to add your server to the SAN. Launch MDSM, select your SAN and click Manage. 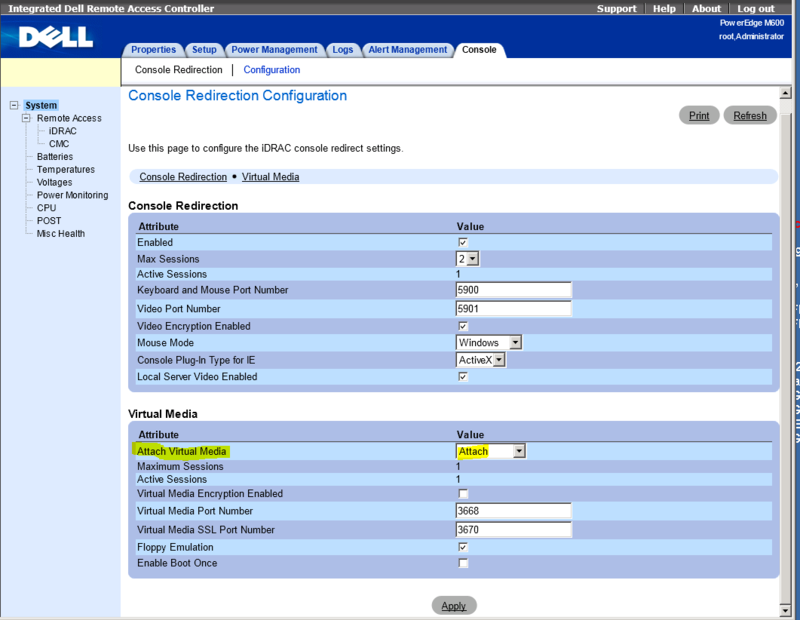 Click Configure tab, then select Configure Host Access (Manual). With this setup, I’ve been unable to get Auto to work, but adding it Manual works just fine. Moment of truth, now it’s time to see if your adapter is seen. Horray! My adapter is seen and matches the name I setup in the iscsi configuration file earlier. Select it and click Add. Then add any other nodes and finish the wizard accordingly. You should see that WWID there. This is a horrible name and I sure don’t want to map a WWID as a drive? I’m guessing you don’t want to either. This is where having an alias is great. Let’s append the configuration file to setup an alias. Next, issue a restart of multipath and run the list again. Notice, our alias is showing up here, and if you do an ls of the /dev/mapper directory again, you’ll see the alias. Now we need to setup a partition and configure the filesystem type. We’ll use parted. You can use fdisk, but only for drives smaller than 2 TB. I am also going to use ext4 filesystem on this drive. Now all that is left is to mount it to the location of your choice. You’ll also need to add it to your /etc/fstab file to have it mapped every time you reboot. So there you have it. We have setup a CentOS 6.x server with the Dell OMSA host utilities and successfully configured the MPIO iSCSI connection to a Dell md3000i SAN device. Best of luck to those who read! Any questions hit the comments, I’ll try my best to help.